Trump is tapping hateful former Fox News anchor Heather Nauert as his new United Nations ambassador. On Fox News, Nauert spewed toxic anti-Muslim hate again and again. She shamed refugee activists. She stoked racist fearmongering by claiming that migrant children were carrying diseases. And her entire diplomatic experience is six months making excuses for Trump’s atrocious foreign policy decisions as State Department spokesperson. 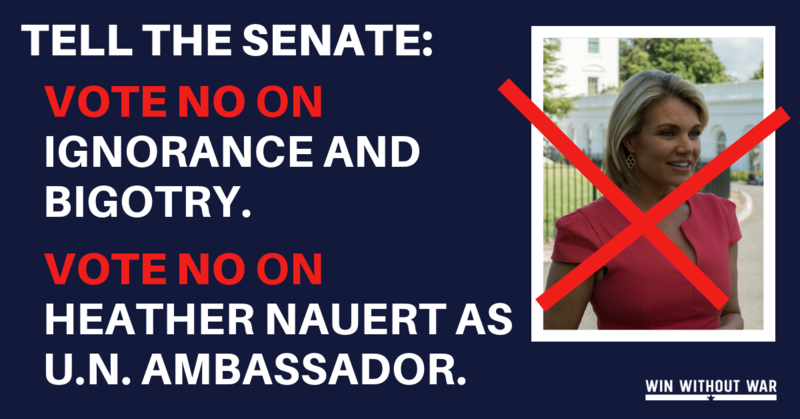 Add your name to tell the Senate: Heather Nauert is entirely unfit to be U.N. ambassador. Vote No. Heather Nauert is an unqualified hatemonger. Do not let Donald Trump make ignorance and bigotry the face of U.S. foreign policy. Vote no on Heather Nauert’s nomination as U.N. ambassador.